We want to emphasize the equal importance of both numerical dissipation and dispersion, which can be generated from both the space and time discretizations. It is well-known that standard central finite difference (FD) schemes and energy-preserving schemes have no numerical dissipation in space. However, numerical dissipation can still be introduced by time integration, e.g., explicit Runge-Kutta schemes. 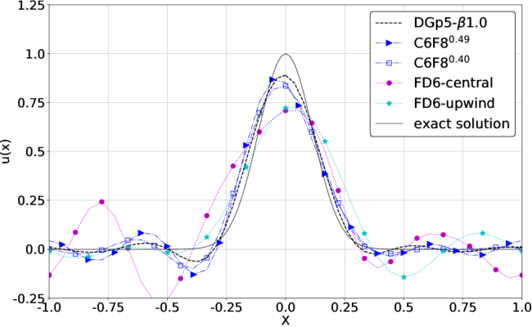 We recently analysed and compared several 6th-order spatial schemes for LES: the standard central FD, the upwind-biased FD, the filtered compact difference (FCD), and the discontinuous Galerkin (DG) schemes, with the same time integration approach (an Runge-Kutta scheme) and the same time step. The FCD schemes have an 8th order filter with two different filtering coefficients, 0.49 (weak) and 0.40 (strong). We first show the results for the linear wave equation with 36 degrees-of-freedom (DOFs) in Figure 1. The initial condition is a Gaussian-profile and a periodic boundary condition was used. The profile traversed the domain 200 times to highlight the difference.